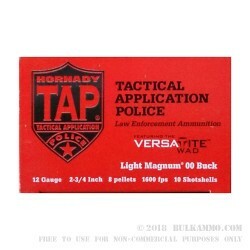 Hornady’s Tactical Application Police line of ammunition is made for one specific purpose: To provide street-ready shells and cartridges that law enforcement professionals can depend on during any tactical situation. This 12 Gauge shotshell is loaded to provide a muzzle velocity of 1,600 fps, and works in both semi-automatic and pump action shotguns. It is loaded with 00 buckshot, which is ideal for home defense owing to both its superior stopping power and penetration over all other commercially available sizes of buckshot. This line of ammunition is intended for law enforcement sales only, but we are proud to offer it to you whenever it becomes available to the civilian market. Your home deserves the same protection that a police officer would give it -- were one able to instantly materialize there with a shotgun during a home invasion.